I have spent most of my life in the North of England and am therefore very familiar with the region's muted light and the colours and shades of the Northern landscape. In my work I aim to recreate these tones and the different moods created by the changing seasons and differing weather conditions. I also have a permanent base in North Wales which provides the opportunity for painting boats and coastal scenes in this beautiful area. When I was 16 I was offered a place at Art College but for various reasons I did not take this up and my subsequent career followed a different course. I always retained an interest in art and a few years ago, with the encouragement of a friend, I began to paint again, and I now spend much of my time pursuing this absorbing occupation. In the Landscape Gallery and the Coastal/Boat Gallery you will find paintings reflecting my interest in the North of England and North Wales, as well as several from other areas. In the General Gallery you will find paintings of other subjects which have inspired me. The Car Art Gallery reflects my life-long passion for all things automotive. I continue to develop my interpretation of subjects and themes in my artistic work by studying under professional artists and through my own personal study of artists' work by visiting exhibitions of both past masters and modern artists. 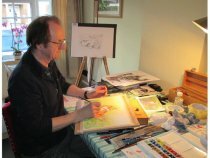 I am a member of the Altrincham Society of Artists. I hope you will enjoy browsing through the Galleries.